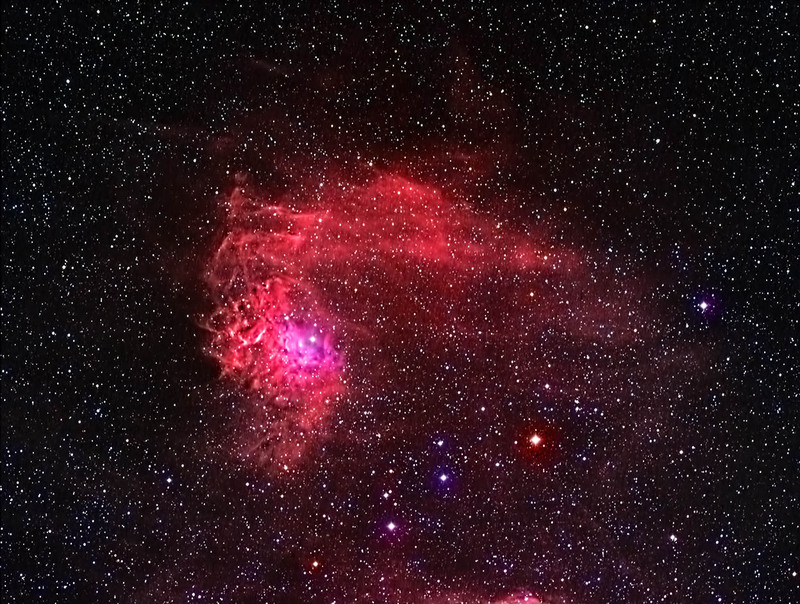 IC 1805 (Sh2-229, Caldwell 31) is commonly known as the Flaming Star Nebula. This is an emission/ reflection nebula . The "flaming" is attributed to reflection of the bright (type O) star AE Aurigae at its center. Luminance: 25 @ 5 min. Images were focused using the camera's live view. They were calibrated, aligned, and combined in ImagesPlus. Luninance images were obtained using a Kenko R-64 filter. The color and luminance images were aligned in RegiStar. They were blended and adjusted in Photoshop. It was slightly cropped. Topaz Detail and DeNoise were applied to the final image. Taken from my backyard on 11/7-8/15.